If it's an older EQ setting brought over from v2, try clearing and then re-saving it. No it is not. I tried reinstalling, clearing data, making new & different presets - same results. But only for loudspeaker - headphones and BT speaker don't have the same problem. As it seems to be repeatable, it sounds like something @maxmp might want to take a look at then. I tried reinstalling, clearing data, making new & different presets - same results. Since V3 the TONE settings are included in the EQ presets - you had TONE activated and set to the desired values when saving the EQ preset ? Please refer to this video https://streamable.com/gg4ju - everything that I did/do is shown. And yes, of course, as you will be able to see in the video, I had them activated every time, and also at the time of making the preset. So, nothing? Oh, and by the way, the gapless never works, and never has, at least for me. I don't know why (not one version has worked with any of my phones or songs, and I had Xperia M, Axon 7 Mini, and now A2 Lite), so I've always had to use crossfade. So, nothing? Oh, and by the way, the gapless never works, and never has, at least for me. Are your files actually gapless? Have you tried increasing the gapless pre-load buffer? Me sucede lo mismo en Moto g6 plus Android 9, Power 821. Mostly they all are, but not all of them. No I haven't. But anyway, this is not such a big deal for me, the EQU and TONE turning off is way worse. Hi there, am a new user having lurked for several years having used Poweramp several years. Just wanted to inform that I too am having the same problem, tested it just now today. The loudspeaker preset turns EQU and TONE off by itself and needs to be manually turned on every time I want to play music on the loudspeaker. 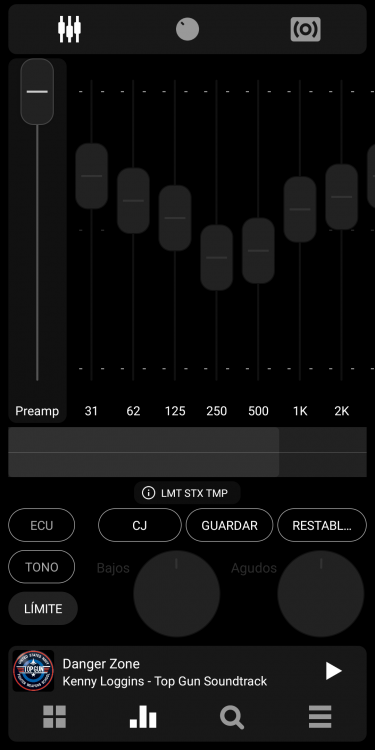 Headphones does not have the same problem, EQ and TONE are default enabled there in my experience. Hope this is something Max is able to fix in a future update. Thanks.